Queen City Ringers, a community handbell ensemble from Charlotte, NC, brings music and excitement to the community. Originally formed in the 1970's as an outlet for directors to ring, Queen City Ringers now attracts performers from many walks of life and musical backgrounds. Enjoyable to hear and a thrill to experience, Queen City Ringers has become a much sought-after performing handbell choir and delivers advanced sacred and secular musical selections. 4. To encourage the public appreciation of and interest in handbell music. 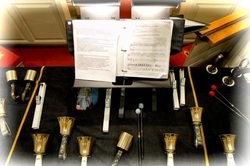 The group currently rings 6+ octaves of Malmark handbells and 5 octaves of Malmark choir chimes, and is a member of the Handbell Musicians of America. Rehearsals are on Tuesdays from 7:00 - 9:00 PM.